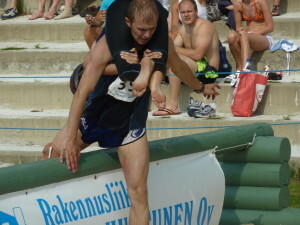 Wife carrying (in Finnish language, eukonkanto) is chivalry at its finest. It is a sport in which a man carries a woman over an obstacle course and the prize for the fastest couple is the woman’s weight in beer. John has been competing in wife carrying races since 2001. In 2004 he won the US title and in 2005 traveled to Finland to represent the US at the world championships (NBA legend and pseudo-ambassador to North Korea, Dennis Rodman, also competed in 2005). Later that year John moved to Finland to train with the Eukonkanto masters and perfect his wife carrying technique. In 2009 he moved to London and in 2010 won the UK wife carrying title. As odd as it sounds, wife carrying is in John’s blood. He is of Nordic ancestry (“Lund” is a Swedish name) and comes from a long line of Vikings. If you piss him off, he will chop off your head with a battleaxe, pillage your village, and drink mead from your skull while he carries your wife off into the sunset. Go ahead, try him.